Maulana Karenga (born on 14 July 1941) is a black nationalist and pan-African scholar and activist. In the 1960s he established the cultural organization US, invented the Kwanzaa celebration, and introduced the Kawaida system of Afrocentric moral philosophy. After serving a prison sentence for felony assault in the early 1970s, he earned two doctorates and became the Africana Studies department chair at the California State University, Long Beach. We have to distinguish between riots and revolts.… Riots are illegal. A revolt is legitimate because it is what people must do to express self-defense, self-determination, and self-direction. So what, then, is the use of art — our art, Black art? Black art must expose the enemy, praise the people and support the revolution.… We do not need pictures of oranges in a bowl or trees standing innocently in the midst of a wasteland. If we must paint oranges and trees, let our guerrillas be eating those oranges for strength and using those trees for cover. We are not interested in spookism which is what our spiritualism in Africa degenerated into. That is, invested in a spook estate up in the sky and paying little attention to real estate on this earth. Belief in spooks who threaten us if we don't worship them and demand we turn over our destiny and daily lives must be categorized as spookism and condemned. I have been blessed to see my work flourish. Many people in history — Marcus Garvey, Ida B. Wells, Martin Luther King Jr., Malcolm X — never lived to see their work flourish. I have seen people around the world embrace my philosophy and principles, involving themselves in a cultural institution that my organization and I created. That's something. One of the greatest powers in the world is the ability to define reality and cause others to accept it. This power is even increased although negatively when one can define reality and make others accept it even when it is to their disadvantage. Kwanzaa was conceived, created and introduced to the African community as an audacious act of self-determination. 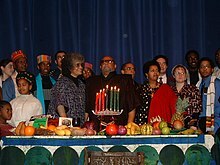 Annual Kwanzaa Message (2009) "Principles and Practices of Kwanzaa: Repairing and Renewing the World." Sometimes brothers get so hung up on the myth of revolution that they talk about bringing America to her knees and they can't even wipe out one police station. A lot of brothers play revolutionary; they read a little Fanon, a little Mao and some Marx. Although this information is necessary, it is not sufficient, for we must develop a new plan of revolution for black people here in America. We stress culture because it gives identity, purpose and direction. It tells us who we are, what we must do, and how we can do it.